Welcome to one of the most extraordinary accommodations in the world! 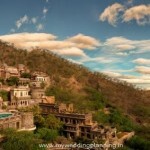 Neemrana Hotel offers history and fantasy, memories and inspiration. 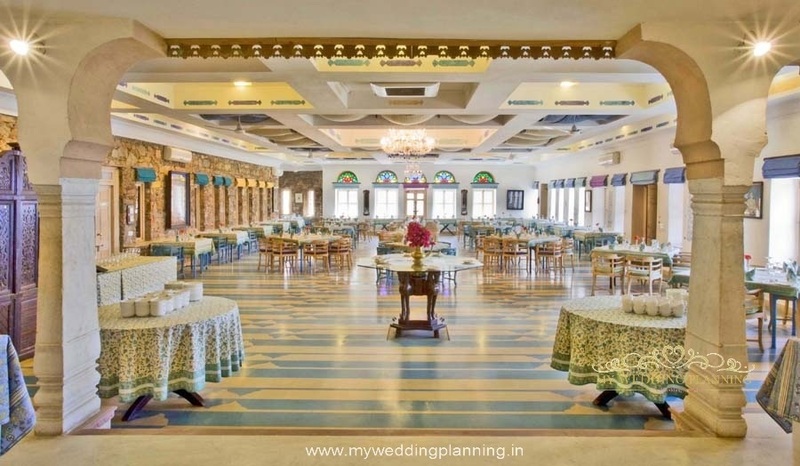 You’ll feel like royalty when you snuggle into an antique four-poster bed, glide down a sweeping, elegant staircase, or feast on a sumptuous dinner in a tapestry-hung dining room that was once a Mewar fortress. This 15th century heritage hotel is a dream wedding venue that is steeped in history and rustic charm. Seven palace wings built over 12 layers tiered into a hill across 2.5 hectares/ 6 acres of garden-palace, makes Neemrana Fort-Palace one of the most unique resorts in Rajasthan. Hanging gardens, two pools to swim out to the horizon, an Ayurvedic spa, and India’s first zip-line is what the world comes to experience! One stay here will get you started on the discovery of one of the best resorts in India. 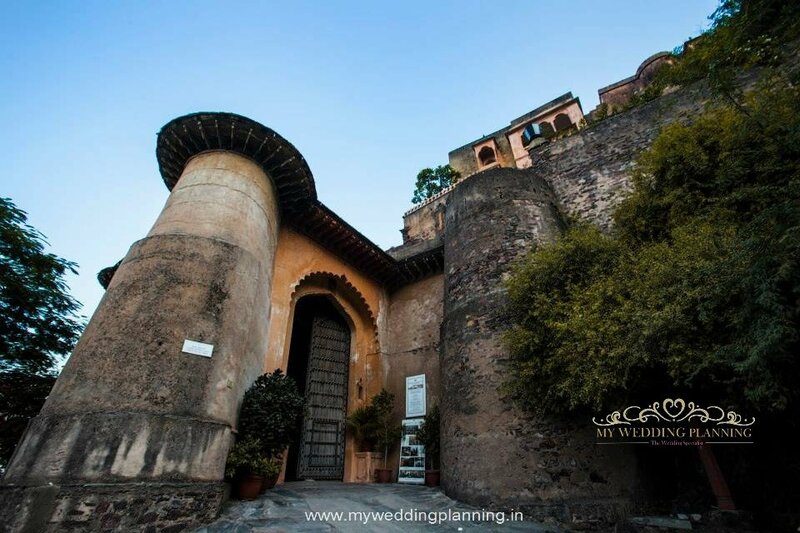 We at MWP recommend you to consider this fort for its medieval, rustic touches and as an ideal outdoor garden setting with a fortress as a gorgeous wedding backdrop! 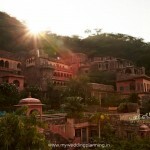 If you’re searching for a unique fort wedding or palace wedding destination, Neemrana is a terrific option. 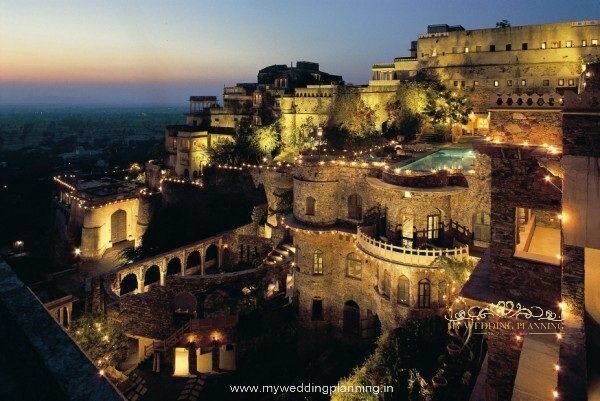 Neemrana Fort-Palace is even more amazing than its photographs can describe it! Get married with festivity, drums, dancing, strings of marigolds and showers of rose petals. 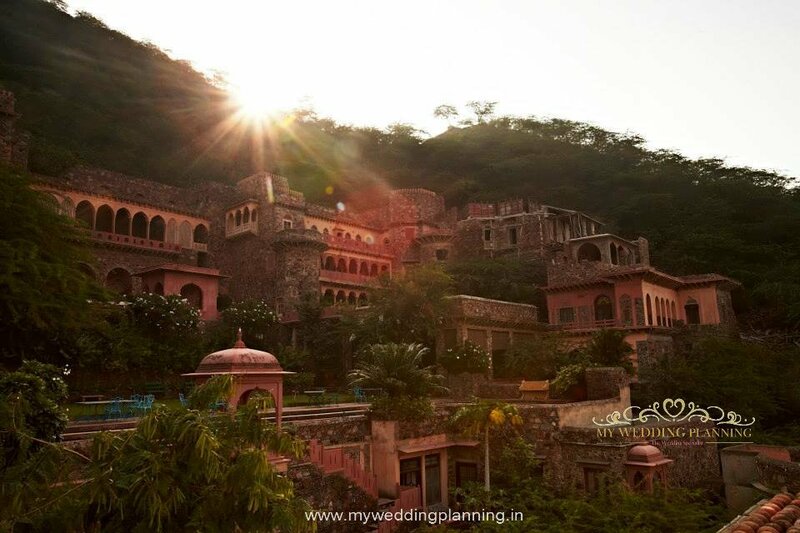 Now with a Roman amphitheatre which seats some 200 people; hanging gardens that are so mystical; as well as varied locations for the day and night functions, fort weddings and palace weddings are sought after for their magic! Who doesn’t want to feel like royalty on their big day? 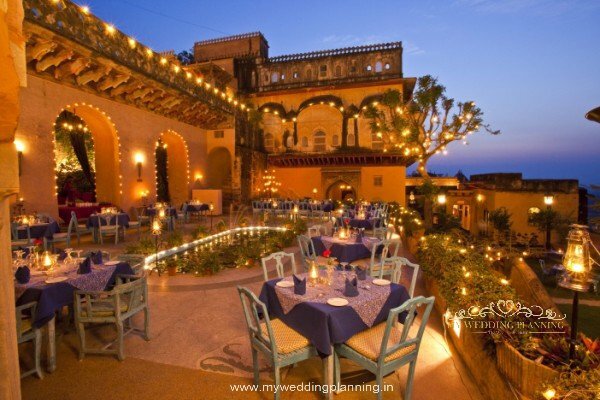 Neemrana Hotel offers couples a wonderful variety of wedding venues to choose from. Each wedding locations can be done up to feature sophisticated décor and an elegant ambiance, perfect for your style of ceremonies and wedding reception. Why get married in a boring hotel chain when you could walk down the aisle in a fortress? It’s not just a matter of opulence and splendor (not that there’s anything wrong with a taste for grandeur)–there’s history and romance, too. The hotel organizes the Neemrana Music Foundation, which is a special programme on every Saturday from October till April, and Saturdays therefore in Neemrana are being booked as a special cultural evening. Due to this the hotel does not take any individual group celebration (marriage, large conference, birthday parties etc.) on weekends. 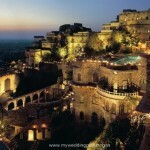 Neemrana Hotel has 73 rooms (71 air-conditioned rooms and 02 air-cooled rooms), accommodating a total of 190 guests. Once the hall of justice, this vast suite offers the options of sleeping on a large bed or a larger baithak. At its heart lies an interesting black and white sitting space capped by a long vaulted roof. A French suite with a pillared verandah overlooking the countryside on one side and a water body on the other offers a flavor of colonial Francis from south India. It has two four-poster beds and a tapestry of Joan of Arc. Neemrana offers a good combination of various dishes from North-Indian , Continental , with assorted mix of French, Italian and traditional Rajasthani cuisine. Food arrangement can be made for upto 300 guests (outdoor venues). A gala dinner can be organized at Rs. 1600/- plus tax per person. · Breakfast will be served between 8:00 & 9:30 a.m.
· Lunch will be served between 12:30 & 2:30 pm. Non-veg dishes can be replaced with vegetarian dishes. Once you decide on the menus, you need to send the same for us to price it, in consultation with our Chef. As per the company policy no personal liquor is allowed . 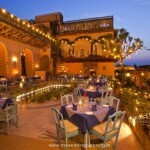 Neemrana Fort-Palace has a well-stocked bar. Personal vendors are not allowed. Kindly refer the attached file of auxiliary services. The services are added as per the guest’s requirements. Decoration of active area (Marriage/program, dinner & Cocktail venues) decorated with floating lights, wax/oil lamps and Lanterns on extra charges . Pandit & beautician needs to be arranged by the wedding party. 15 extra beds can be provided wherever space permits @ Rs. 500/- for a child, and Rs. 800/- for an adult. 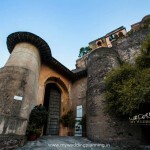 For weddings & such large functions, one is obligated to charter the whole fort. This ensures dedication of the whole service unit to the group and all the private & public areas of the hotel (except the chessboard terrace & rampart garden) at their disposal. 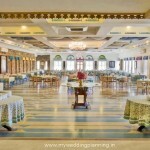 The wedding ceremony and the functions can be organized in the different suitable venues depending on your requirements. Check-in time is 2:00 p.m, and check-out is 12:00 noon. Any wedding functions or stay of the guests will be done during this booked period only i.e. 2:00 p.m of first day till 12:00 noon of the second / last day.